Highly resilient individuals have a major edge in today's turbulent world of non-stop, disruptive change. In the past people had to learn how to become resilient on their own. In this empowering course, Dr. Al Siebert provides practical guidelines for you to learn how to be highly resilient. His well-tested, effective program for mastering the five levels of resiliency shows you how to bounce back quickly from setbacks, make difficult challenges turn out well, and convert misfortune into good luck. Highly resilient individuals have a major edge in today’s turbulent world of non-stop, disruptive change. In the past people had to learn how to become resilient on their own. In this empowering course, Dr. Al Siebert provides practical guidelines for you to learn how to be highly resilient. 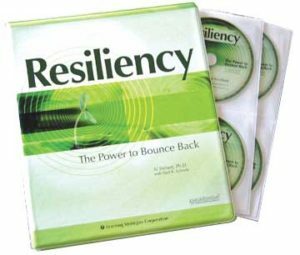 His well-tested, effective program for mastering the five levels of resiliency shows you how to bounce back quickly from setbacks, make difficult challenges turn out well, and convert misfortune into good luck. When you are resilient you enjoy many advantages over less resilient people. You avoid having a self-defeating "victim" reaction that you see in so many others during difficult times. 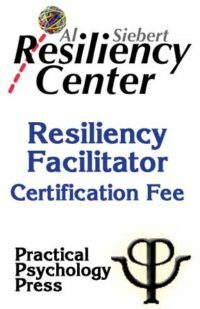 Your personal resiliency learning course emphasizes how to be deeply resilient when pressured to get more work done, in new ways, in less time, with fewer people and reduced budgets while wondering if your job is safe. If you’ve lost your job, it will show you how to cope well, bounce-back, and even convert the experience into a positive life event. thrive under pressure, bounce-back from setbacks, and avoid resiliency fatigue. improve your problem-solving skills by using both left-brain and right-brain thinking styles. keep a playful sense of humor, optimism, and positive feelings during rough times. break free from inner barriers to resiliency by strengthening your inner "selfs" in healthy ways and overcoming the "good child" handicap. overcome tendencies to feel like a victim and stay detached from "victim" reactions in others. value your complex, counter-balanced qualities such as optimistic pessimism. develop your unique way of being resilient by being both self-reliant and socially responsible. become very good at having things work well for yourself and others. convert misfortune into good fortune and master the art of resiliency. Some people ask if this is another stress-management course. It is not! Stress-management activities are useful in developing level one resiliency skills. But this course takes off where others end. In this course you will learn how to tap into many inborn abilities that show you how to handle extreme change quickly, easily, and naturally. 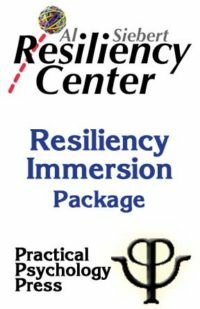 If you truly want to handle non-stop pressure and constant change easier and better, then get the Resiliency course for yourself right now! You will learn specific strategies to quickly and easily recover from any problem or setback–no matter how small or how large–in such a way that you will come out far ahead. 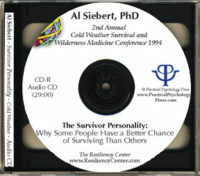 The Resiliency Course includes twelve audio sessions led by Al Siebert and a comprehensive course manual. As a bonus, the program includes four Paraliminal sessions led by Paul Scheele, the master of Paraliminal learning, so that you can absorb the process quickly into your natural way of being resilient. Resiliency is a powerful talent to acquire. This course will help you become deeply resilient quicker and easier than through any other process. Level-Three Resiliency: Developing Strong Inner "Selfs"
Self-Assessment: "How Resilient Are You?" If you do not wish to receive a free copy of Gathering Wisdom, please let us know in the comments field.